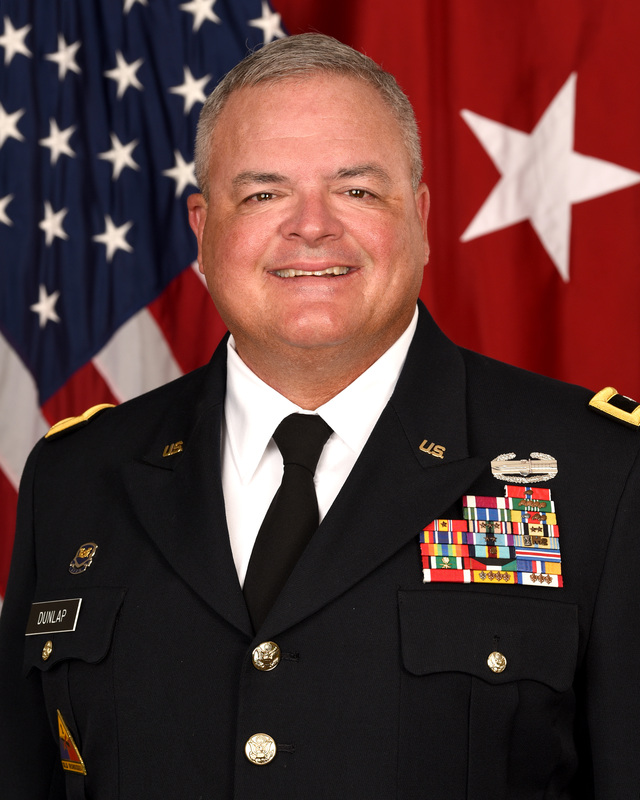 Brigadier General John B. Dunlap III received his BA from LSU in 1986 and his Juris Doctorate from Loyola University in 1989. He graduated from the Judge Advocate General’s School, Army, in 1989. He was then stationed in Germany with 1st Armored Division. In 1990 he deployed to Iraq for Operation Desert Storm. Upon redeployment he was assigned to 4th Brigade, 1st AD. In 1992 he was assigned to Combat Aviation Brigade, 3rd Infantry Division. When he completed his Active Duty service he had tried over 40 Courts Martial including complex larceny, murder and kidnapping trials. BG Dunlap joined the Louisiana National Guard in 1992 and was assigned to 256th Infantry Brigade as the Assistant S-4. After graduating from the Quartermaster school in 1993, he transferred to the Quartermaster Corps. In 1994 he became the Inspector General of the 256th Infantry Brigade and graduated from the Army IG School later that year. In 1995, he became the Assistant State IG. In 1997 BG Dunlap became the Deputy SJA of the 61st Troop Command. In 2000 he returned to the 256th Brigade, as the Deputy SJA and in 2003 he became the SJA. In April 2004, he was mobilized for Operation Iraqi Freedom. He spent a year in Baghdad, Iraq working to re-establish the rule of law and assisting the Iraqi government prosecute terrorists and insurgents. During that year the 256th BCT was the busiest Special Court Martial Jurisdiction in the Army with over 110 Courts Martial and over 400 Article 15’s. Upon redeployment he became the Deputy State Judge Advocate and in 2008 the State Judge Advocate. Since then he has advised The Adjutant General on the full spectrum of legal issues attendant to the Homeland Defense mission of the National Guard. He is a 2003 Graduate of Command and General Staff College and a 2012 graduate of the U.S. Army War College. He is the recipient of the Bronze Star Medal with 1 Oak Leaf Cluster, Meritorious Service Medal, Army Commendation Medal with 4 Oak Leaf Clusters, Army Achievement Medal, Army Reserve Components Achievement Medal with 1 Silver Oak Leaf Cluster and 2 Bronze Oak Leaf Clusters, National Defense Service Medal with 1 Bronze Service Star, Southwest Asia Service Medal with 1 Bronze Service Star, Iraq Campaign Medal with 3 Bronze Service Stars, Global War on Terrorism Service Medal, Humanitarian Service Medal with 2 Bronze Service Stars, Armed Forces Reserve Medal with Silver Hourglass and M Device, Army Service Ribbon, Army Overseas Service Ribbon, Army Reserve Component Overseas Training Ribbon, Kuwait Liberation Medal (Saudi Arabia), Kuwait Liberation Medal (Kuwait), Louisiana Commendation Medal, Louisiana War Cross, Louisiana Emergency Service Ribbon with 27 awards, Louisiana Longevity Ribbon with 3 Bronze Fleur de Lis, and the Combat Action Badge. BG Dunlap has been in the private practice of law in Baton Rouge, Louisiana since 1992. He is married to the former Jill Mason and has three daughters, Elizabeth, Emily and Camille and two stepdaughters, Olivia and McKinley Grace.